Ever since the beginning of agriculture, cereals have provided unlimited health benefits as a staple food in our diet. Cereals are rich in complex carbohydrates that provide you with ample energy and help to prevent cancer, constipation, colon disorders, and high blood sugar levels. They also enrich your overall health with abundant proteins, fats, lipids, minerals, vitamins, and enzymes. Cereals are enriched with niacin, iron, riboflavin, and thiamine, and most cereals have abundant fiber contents, especially barley, oat, and wheat. Cereals also have soluble bran that aids in lowering blood cholesterol levels and keeping heart diseases at bay. Cereal consumption also means an intake of high amounts of protein; breakfast cereals are often eaten with milk, which makes for a protein-rich meal. For infants, iron-fortified cereals are said to be the premium solid foods. Cereals or grains belong to the monocot families, ‘Poaceae or Gramineae’ and are cultivated widely to obtain the edible components of their fruit seeds. Botanically, these fruits are called ‘caryopsis’ and are structurally divided into endosperm, germ, and bran. Cereal grains are cultivated in huge quantities and they provide more food energy than any other type of crop, therefore, they are known as staple crops. Be it world history, the growth of civilizations or development in the human diet patterns, the cultivation of cereal grains has played a significant role. The word ‘cereal’ is derived from ‘Ceres’ – the name of the Roman goddess of agriculture and harvesting. It is said that almost 12,000 years ago, ancient farming communities dwelling in the Fertile Crescent area of southwest Asia cultivated the first cereal grains. The first Neolithic founder crops that actually initiated the development of agriculture include einkorn wheat, emmer wheat, and barley. Other than its superior nutritive value, cereals are popularly used in kitchens all over the world due to their prolific growth and plentiful production in most countries. Different countries have different cereals as their staple food; the reason for this diversity is the production statistics. For example, wheat is the most significant cereal in the diets of most European countries and India. On the other hand, rice is the primary grain used in China, Japan, South East Asia, Bangladesh, Pakistan, Brazil, Myanmar, Vietnam, and the US. The staple food cereal in northern, central America and Africa is maize or corn, while millets and sorghum are widely consumed in India and Africa as well. Many factors like climatic differences, population choice, production quality, and others are responsible for such global differences of cereal consumption in tropical and subtropical regions. Cereals are also known as the “staff of life”. However, this name is not totally justified in a true sense because you probably cannot live on cereals solely for your lifetime and retain optimum health. Breakfast cereal is actually the packaged breakfast food available in almost all commercial food stores. These types of cereals are sometimes eaten cold or mixed with milk or water and then fruits are added for extra nutrition and taste. Cornflakes, porridges, and oatmeals are the best examples of breakfast cereal. Usually, these cereals are soaked or boiled to attain a softened structure, which makes them palatable. Sweeteners like honey, sugar or maple syrup are then added for a better taste. Breakfast cereals have become immensely popular in fast-moving countries, as they provide a bowl full of nutrients in a short and simple way. The most familiar grains used for making the category of cereals include rice, maize, corn, ragi, bajra, wheat, barley, sorghum, Italian millets, and oats. Here let us discuss some of the most widely used cereal varieties. Brown Rice: Brown rice is another variety of rice that is rich in the vitamin B group, particularly thiamine, riboflavin, niacin, and minerals like iron, potassium, phosphorous, and magnesium. Sorghum: It is consumed widely in Africa and Asia and is also considered a good livestock feed. Millet: It is grown widely in Africa and Asia. Millet porridge is extremely popular in China, Germany, and Russia. It is also used in alcoholic beverages and sometimes as bird and animal feed. Oats: Oats were initially a staple cereal in Scotland, however now oats are very popular as breakfast cereals in almost all countries. Owing to the fiber-rich property, oats are considered vital for all ages and are used as livestock feed. Rye: It is an important cereal grown in cold climates. It is used for making bread, beer, whiskeys, and vodka and is also used as animal fodder. Triticale: These are manually made crops that are crossbreeds of wheat and rye. Initially, these crops were harvested only in Sweden and Scotland, but FAO recently declared that in 2009, triticale was harvested by almost 29 countries across the world. Fonio: It is a popular crop grown in western Africa and some remote areas of India. It grows easily in semi-arid regions with poor soil quality and in a short period of only six to eight weeks. Fonio is used in bread, porridge, and beer. Buckwheat: This cereal is popularly used in pancakes, noodles, and porridge. It is popularly used like wheat cereal, but its characteristics are not related to wheat. This cereal is high in protein and amino acids. Quinoa: This cereal is rich in dietary fiber, iron, magnesium, and phosphorus. It is mainly grown in the Andes; however, it is also popular in North America. Other types: Maize, rice, and wheat together make up 87% of total grain production all over the world. There are many more cereals that are used in specific regions and are not as popular as the above-mentioned ones. ‘Teff’ is one such cereal, grown widely in Ethiopia but hardly known elsewhere. It is rich in fiber and protein. It is often used as staple food, or sometimes used as a breakfast cereal. ‘Wild rice’ is grown moderately in North America; ‘Amaranth’ was initially a staple crop of the Aztec Empire and now it’s widely cultivated in Africa. Belonging to the complex carbohydrates food group, cereals are rich sources of minerals, vitamins, carbohydrates, oils, proteins, and fats. Whole cereal grains have an outer bran coat, a starchy endosperm, and a germ. Bran: The outer layers of the kernel are called bran, which is made of about 5% of the kernel. The kernel is rich in fiber and minerals while the bran is rich in thiamine and riboflavin. Aleuron: While refining, the bran layer is removed and the aleurone layer is exposed, which lies just below the bran. This layer is also rich in phosphorous, proteins, fat, and thiamin. Endosperm: Unfortunately, this layer is also lost during processing. When the endosperm is utilized, this large central part of the kernel has a high percentage of starch and protein and is low in vitamin or mineral content. Germ: The small structure at the rear part of the kernel is known as the germ. Rich in protein, fat, minerals, and vitamins, this germ is a storehouse of nutrients for the seeds while germinating. Cereals are probably the greatest source of energy for humans. Providing almost 30% of total calories in a regular diet, cereals are probably the most widely consumed caloric food in America. This percentage rises in places like rural Africa and Asia where cereals are reported to supply almost 70 to 80% of energy requirements (since people in these regions cannot afford to eat other food products like fruits, vegetables, meat, or milk products). Cereals are inexpensive and a widely available source of energy; this is probably the prime reason why people from all budgets prefer cereals as the major energy provider in their diet. Cereal intake tends to be quite high amongst poor income families as they attain a good amount of energy through minimal expenditure. In cereals, around 95% of minerals are sulfates and phosphates of magnesium, potassium, and calcium. A good amount of phosphorous, called phytin, is present in cereals. The phytates present in the cereals considerably reduce the activity of iron absorption. The unrefined cereals have more phytates as compared to refined cereals. After the seeds germinate, phytates diminish due to the breakdown of enzymes, and then the iron content is enhanced. This is the reason why malted flours of cereals are said to have more nutritional value than raw flour. Zinc, copper, and manganese are also present in small quantities. Cereals hardly have calcium and iron, but ragi is an exception to this. Amongst cereals, rice is the poorest source of iron and calcium. Ragi, millets, jowar, and bajra have high amounts of minerals and fiber. Whole wheat products reduce the chances of breast cancer. Cereals are rich in phytosterols or plant-based steroids and plant estrogen that stimulate the hormone estrogen. Phytosterols bind to estrogen receptors present in the tissues of the breast and block human estrogen that promotes the growth of breast cancer. Many studies have shown that colon cancers can be avoided by consuming whole wheat products or any fiber-rich cereals. Phytosterols increase the stool movement through the intestines, thereby constricting the re-absorption time of the estrogen into the blood through the colon wall. Cereals have both insoluble and soluble fibers like cellulose, pectin, and hemicellulose. These fibers are present in the bran and pericarp, which often gets demolished while processing, thus it is advisable to consume whole cereals to cure extreme constipation troubles. 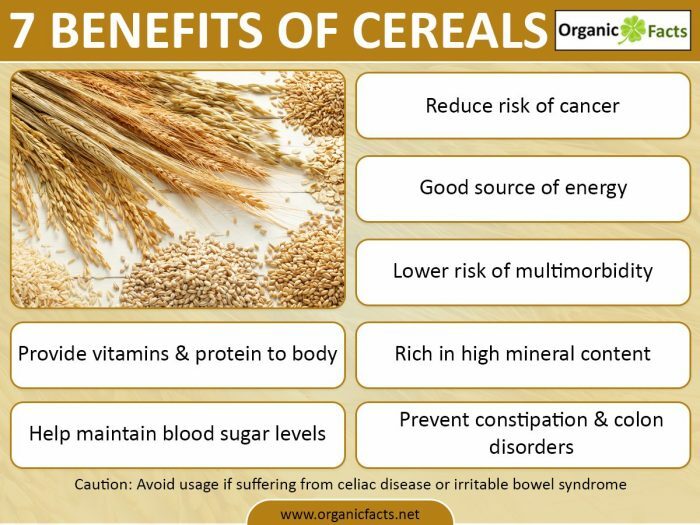 Cereals also effectively improve peristalsis in the intestine and increase the bulk of the stools, thus keeping your internal system clean. Ragi is high in cellulose and has excellent laxative properties that relieve constipation. Brown rice is also helpful for treating this disorder. The fiber content in cereals decreases the speed of glucose secretion from the food, thereby maintaining sugar levels in the blood. Proteins are present in every tissue of the cereal grain. The concentrated protein-rich areas are scutellum, embryo, and the aleurone layer and moderate amounts can be found in the endosperm, pericarp, and testa. The concentration of proteins becomes denser in the endosperm from the center to the borderline. The cereal proteins are of different types; like albumins, prolamines, gliadins, globulins, and glutelins. These types of proteins are called “gluten” proteins. This gluten has extraordinary elasticity and mobile properties, mainly present in wheat grain, but also in some other types of cereal. Cereals usually have 6-12% protein but they lack lysine. The protein content varies in each type of cereal. For instance, rice contains less protein in comparison to other cereals. In fact, the protein percentage even varies with different varieties of the same cereal. Although less in amount, the quality of rice protein is better than the protein of other cereals. When you consume cereals with pulses, the protein quality automatically improves, owing to the mutual supplementation. Pulses have high lysine content and are deficient in methionine; on the other hand, cereals have an abundance of methionine. Recent research suggests that a greater consumption of vegetable, whole grain products, and fruits may lower the risk of multimorbidity. If you are suffering from a deficiency in the vitamin B complex, add whole grain cereals to your diet. Most of the vitamins of cereals are present in the outer bran, but the refining process usually reduces the vitamin B content, and thus it is advisable to consume whole grain cereals. Cereals are usually devoid of either vitamin A or vitamin C; only maize has small amounts of carotene. The cereal grains are processed to extract oils that are rich in vitamin E. Rice bran oil has more concentrated amounts of vitamin E than other oils available on the market. Cereal grains are rich in enzymes, particularly protease, amylase, lipases, and oxidoreductases. After the seed germinates, the amylase content actively increases. The germ encloses the protease enzymes. Cereals are undoubtedly full of nutrition, but unfortunately, the refining process degrades their quality. The degree of milling, polishing, and refining to some extent decides the nutrient content of cereals. Some nutrients are lost during food preparation, especially vigorous washing, soaking, and cooking methods, which result in the depletion of the nutrients on the skin of the grains. There are some disadvantages of cereals when it comes to excessive consumption. Most of the commercial varieties of cereals have an abundance of salt, sugar, and fat which should be avoided in excess. Moreover, the high-bran products often lead to discomforts like abdominal pain, bloating, and intestinal gas flatulence. If you have too much of these products, the body’s capability of iron, zinc or other mineral absorption decreases radically. Most grains are acidic in nature, thus they can produce an acidic state within the tissues and blood. Uncontrolled cereal consumption can lead to premature aging and increases the chances of certain diseases like arthritis. Grains are comparatively more difficult to digest than salads, fruits, sprouts or vegetables, so it is always recommended to have cereals in moderate amounts to avoid chronic disease conditions. Even then, cereal grains are advised to be consumed after mild cooking. Excessive heat destroys the minerals, enzyme, and vitamins of cereals, so baking or steam cooking is preferred in most cases. If you are suffering from coeliac disease or irritable bowel syndrome, try to avoid whole grain cereal as they aggravate such conditions. It is often found that children are fond of cereals, as you can make them in a plethora of ways and they keep children filled for a long time. Grains have proven to be a great food for kids since ancient times; they provide energy and enough nutrition required for healthy growth. If you can feed your child with at least one cup of cereal, your child gains almost half the daily requirements of most vitamins and minerals. If you add milk or yogurt to the cereal, it will enhance the nutritional content of the meal even further. However, choosing the right cereal for your child is very important. 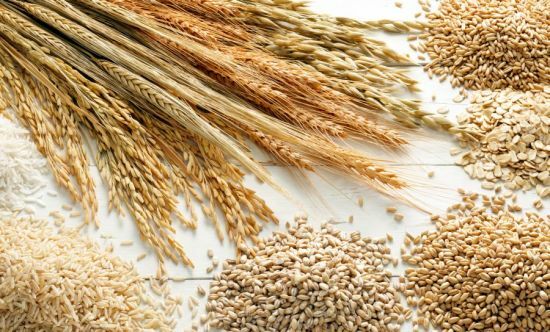 Check out cereal grains that have ample amounts of protein, iron, and fiber. Protein aids in growth during the developmental years, iron is very important for healthy blood formation and fiber is necessary for a clean digestive tract. Good choices for your child during mealtime include millet, barley, buckwheat, rye, oats, and whole wheat. You can also introduce juicy cereals to your kids. As said before, when you add milk to cereals they create a complete protein meal. If your child needs calories and protein, primarily go for a milk and cereal combination. On the other hand, if your child is in need of proper iron absorption, then a juice and cereal mixture will also serve beneficial.